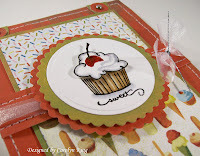 It seemed like an easy enough challenge---use the adorable Hey There Cupcake set by Stampendous and the fabulous Cupcake Basic Grey paper and make a card. Seemed easy.........until I tell you WHO initiated the challenge---two dirty girls whom I greatly admire--Tosh and Laurie. Yep---totally outranked..oh well...it sure was fun to play with these stamps though (Thanks Tosh!). Check out their blog links above to see what they created for this triple challenge! I stamped the cupcake image and colored it. The frosting was stamped and cut out. I put it on foam tape for some added dimension. The cherry is covered in red stickles and I added some Sakura stardust gellyroll pen to the icing. I finished the card by adding some beautiful May Arts sheer ribbon. I used my new Ranger white gel pen to connect the faux stitching and on the top I added the tab punch/circle punch design that I so often do. I just love these adorable stamps--the sets comes with TONS of different cupcake options AND sentiment options. Fun stuff! You can see the icing is popped up and I popped up the Nestability layers too. 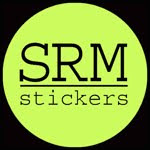 Materials used: Hey There Cupcake clear stamp set (Stampendous); white cardstock (Stampin' Up! ); Designer paper-Cupcake (Basic Grey); brilliance black ink; Copic Markers; Sakura Stardust gellyroll pen; red stickles; Cuttlebug (Provocraft) and Nestability dies (Spellbinders); ribbon (May Arts); silver cord (Stampin' Up); small oval punch, small circle punch (Stampin' Up! ); Ranger white gel pen; paper piercing tool and mat pack (Stampin' Up! ); dimensionals (SU!). Thanks for the challenge, girls. I can't wait to see what your creative minds came up with! Oh how yummy looking! Fantastic job colouring that cupcake...wow! Fabulous layout too. Everytime I see you use the punches on the top of a card, I want to do it. Suppose if I jot it down, I may remember to try it ;) TFS!! Wonderful card! I love the cupcake, paper, and layout. Beautiful work!! OH, yumm-o! What a fun and delish challenge! Your card looks good enough to eat, 'cept it's too pretty, lol! Fun stuff with those dirty girls! Have a wonderful weekend and Mother's Day! hugs! You thinks you've been had...me thinks you've just TOTALLY enabled me to buy this cupcake stamp. Oh my, I LOVE how you popped up the icing. Yumm-o! Cammie, me thinks you are SO FULL OF IT!!!! I have no idea what you were talking about...your card is the BOMB!!!! I love your unique layout...your coloring is fantastic...and your use of the patterned paper is genius!!! I LOVE it!! Have a wonderful Mother's Day!! this is such a great card!! i love that you popped up the frosting, since that's the best part!! Happy Mother's Day! Yummmmmy, looks good enough to eat! Now I want something sweet! Cute card! I think you did a great job on the card -- looks very cute and so festive! Love all the dimension! Outranked my foot!! You did a great job on your card. This is totally the BOMB!!! Girl...this is completely, without a doubt, adorable!!! I love the colors!! And the icing...perfect with the cherry in it...the tabs...the right touch...the layout...well, it just makes me want to eat...thanks a lot!!! I knew you two would show me up. No more crazy ideas like this one...that's for sure!! I think it is super fabulous!!! Love it!! 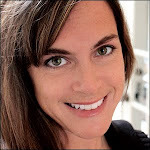 Well, I think it's just adorable Cammie! Love the layout and the Stickles. The faux stitching is the perfect touch. It's adorable Carolyn. Just sweet! Adorable card Carolyn! I admire all of the work and fine detail that you put into your cards! I think this is totally yummy - love that cupcake, your coloring is FABULOUS!!! Have a fabulous Mom's Day! Yummy and Gorgeous!! I love the coloring, papers, stickles, dimension...everything!!! Your cupcake looks so yummy, and I love your little tabs at the top! Fantastic!! 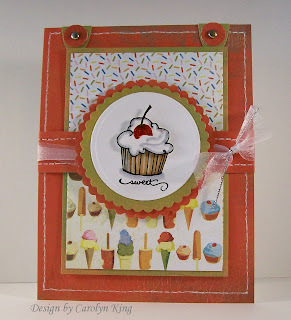 I love all things cupcake - and your card is fabulous!